As I looked around me I noticed a few other people doing the same thing while rushing for their trains. Later on while looking through the images on Instagram there were people ‘liking’ my rainbow photo and they also had a photo of the same rainbow from a different viewpoint. 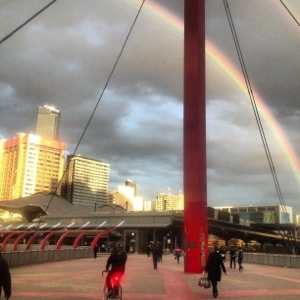 I tagged my photo with #melbourne but not #rainbow!! How does this happen? Are they just looking at a stream of the latest image uploads? It really does make you think about controversial incidents or dramatic events or especially political or criminal situations. Who saw what? This entry was posted in Uncategorized and tagged crowd, Instagram, Melbourne, photo, rainbow, social networking by suesbent. Bookmark the permalink.